Port Sunlight River Park has linked up with a national Keep Britain Tidy campaign to highlight the issue of dog fouling and reduce the number of owners who don’t bag and bin their animal’s poo. Research shows that nine out of ten dog owners do pick up after their pooches, so the initiative uses posters that urge the other one in ten to be responsible pet owners too. Variations of the poster highlight the importance of reporting those who do not clean up after their dogs, urging people to contact the Park Ranger, or Wirral Council Street Scene. Feedback from other parks who have run this Keep Britain Tidy campaign shows that dog fouling increases in the shorter months when nights are drawing in, with dog owners feeling that they can ‘get away with it’ if no one can see them. 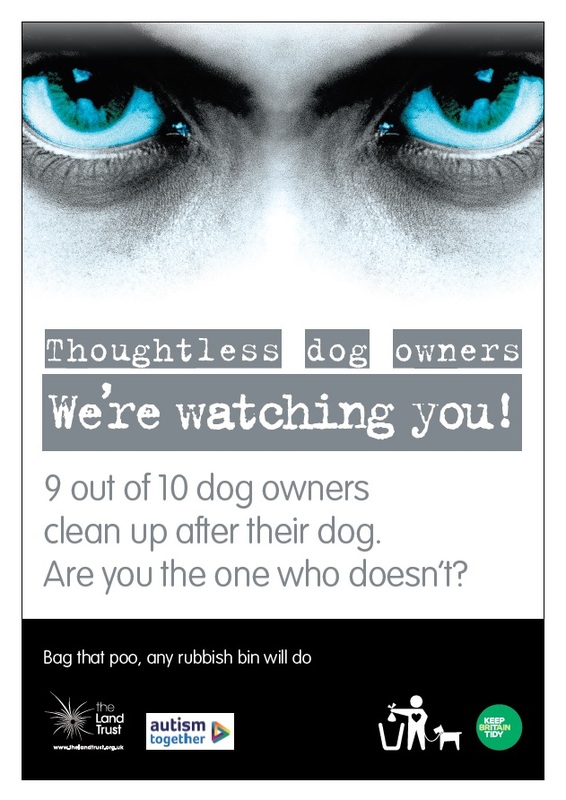 Therefore, the hard-hitting posters remind thoughtless dog owners “We’re watching you” and even glow in the dark. The campaign will run for several weeks and target known dog fouling hot-spots around the park. Port Sunlight River Park, the site of a former landfill in Bromborough, is owned by the Land Trust and managed in partnership with Autism Together, whose staff, service users and dedicated volunteers work hard throughout the year to keep it looking great, benefiting people and wildlife. Anne Litherland, Park Ranger for Autism Together, said: “Dog fouling impacts everyone who uses the park and is a particular hazard to those working on site. Unfortunately we have to dedicate quite a lot of time to picking up after people who don’t take responsibility for their dog’s mess. It’s unpleasant, unhealthy and takes up time and money that could be better spent on maintaining paths, providing educational resources, and enhancing the park for people and wildlife. Park visitors can report dog fouling to Anne Litherland on 07857 550060 or Wirral Council Street Scene on 0151 606 2004 or at www.wirral.ogv.uk/environmental-problems/street-care-and-cleaning/dog-fouling.